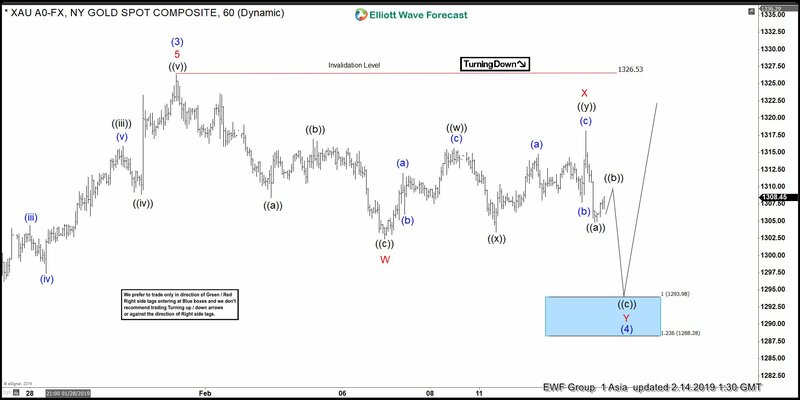 Elliott wave view in Gold suggests that rally from August 16, 2018 low ($1160.37) is unfolding as anElliott Wave Impulsestructure. Rally to $1326.53 ended wave (3). Wave (4) pullback is in progress as a double three Elliott Wave structure. Down from $1326.53, wave W ended at $1302.4 and wave X ended at $1318.17. Internal of wave W takes the form of a zigzag Elliott Wave structure. Wave ((a)) of W ended at $1308.40, wave ((b)) of W ended at $1316.9, and wave ((c)) of W ended at $1302.40. Internal of wave X takes the form of a double three Elliott Wave of a lesser degree. Wave ((w)) of X ended at $1315.63, wave ((x)) of X ended at $1303.4, and wave ((y)) of X ended at $1318.17. Wave Y is proposed to take the form of a zigzag Elliottwave structure where wave ((a)) ended at $1304.90. Near term, while wave ((b)) bounce stays below $1326.53, expect another leg lower to $1288.28 $1293.98 in wave ((c)). This move lower should also end wave Y of (4). Expect buyers should appear in this area for new high in wave (5) or at least a 3 waves bounce. We do not like selling Gold.